With a year and a half of Responsive Design behind us, I'm able to speak from experience about the pros and cons of this timely technology and to recommend whether to utilize Responsive Design, not to use it, or whether to go for a separate mobile site. Responsive design is generally a positive option as we all recognize the ascension of mobility in our culture. With that said, while it is the right solution for most sites, in the B2B world, it should not always be a foregone conclusion. A well known fact about Responsive Design is one that clients often understand intellectually, but not practically: Responsive design, which works on the desktop, tablet and smart phone, is just one design, which has been coded and designed to shapeshift according to the device on which it is displayed. Because it is but one design, there is a very limited set of changes the web designer can make on just the mobile version, that will not affect the other versions. What has helped clients better absorb this truism is to show examples of other responsive sites. Yet the misperception lingers that the mobile site is malleable. There are still quite a lot of companies with separately designed mobile sites that contain different content and behave differently from their desktop brethren. These sites can skew the impression of what to expect with a Responsive website. Essentially, think of a Responsive website as the middle ground between a custom designed mobile site and a non-responsive (traditional) website that is not optimmized for mobile at all. A Responsive site removes the need to pinch and zoom to see things, but it also requires you to simplify your desktop design quite a lot, so it reduces gracefully. In my March 25th post, "Why Most Websites look the Same," I noted that Responsive web designs were starting to make the web look homogenous because web designers recognize that long scrolling pages, simple compositions, flat graphics, big icons, big type and modular designs tend to reduce most easily to the smart phone form factor. For B2B companies that have seen their mobile traffic rapidly rise, following this design trend is probably the right option. But there is a small selection of B2B companies for whom having a truly unique website and user experience is not worth the sacrifice just to solve the pinch and zoom issue for the still lower percentage of serious mobile visitors to their site. There are also B2B companies running catalogue sites for which the desktop user and mobile user require more custom experiences, which warrant a separate mobile site. Price - A Responsive site requires more design and coding due to the three form factors, thus increased cost. Audience needs and expectations - Weigh your priorities, and the needs of your audience to the pros and cons of Responsive Design. Brand perception - Having a Responsive site can be a case of what Marshall McLuhan termed, "the message being the medium," i.e. 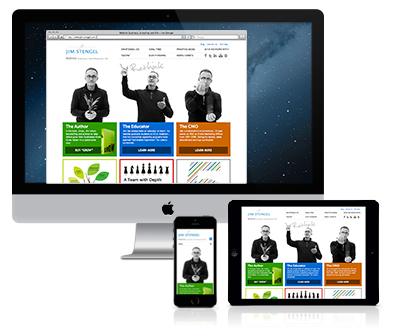 just by having a Responsive site, you look current. On the other hand, a super simple site, like so many that we are seeing, may not be the best avenue for building unique brand perception. Importance of lead generation- While all sites can be well optimized for lead generation, creating modular "tiles" is particulary suited to a Responsive Design and is very flexible for swapping offers in and out of a site. The Jim Stengel Responsive site we designed (top) is a good example of this. Final thought - Responsive Design is here to stay, which is for the most part a good thing. Just be aware that it does require some modulating of expectations and flexibility.